Right after the famous “The Phantom Edit” came out, another edit of “The Phantom Menace” surfaced, called “The Phantom Re-Edit”, also known as “The Phantom Edit 1.2″ or “The New York Version”. It was remastered by Magnoliafan. This is a far more extensive edit of the original movie, making Jar Jar into a Jedi-like Sage, maturing up all of the Gungans and tons of minor cuts, edits and changes to pacing throughout. 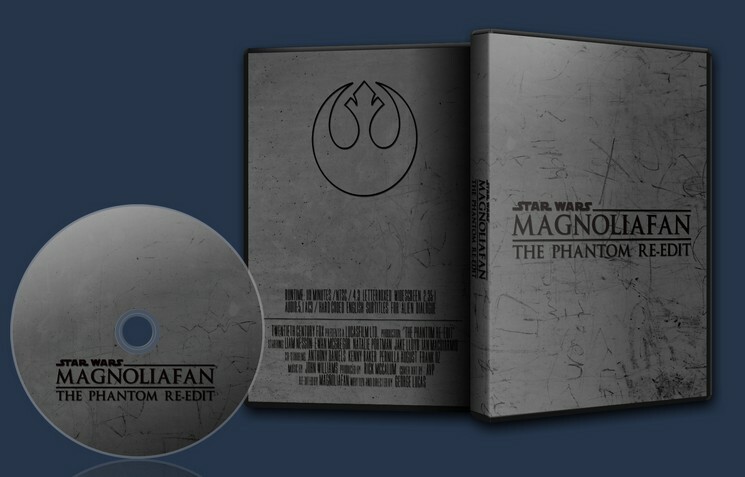 Right after the famous “The Phantom Edit” came out, another edit of “The Phantom Menace” surfaced, called “The Phantom Re-Edit”, also known as “The Phantom Edit 1.2″ or “The New York Version”. This was released and distributed via VHS tape by an anonymous group. Acquiring a low generation copy was very rare. So... Magnoliafan used one of these rare tapes as a source and REMASTERED the fanedit using DVD sources to allow for easier trading and improve the quality of trades by removing the quality loss from making Nth generation copies.